French protests over the country’s proposed gas tax hike are intensifying in Paris as rioters and police clash with rocks, batons, tear gas and fireworks. Protests by so-called “yellow jackets” — named after their neon yellow traffic vests — erupted last week across France. Protesters set up barricades and blocked streets and highways across the country as an estimated 244,000 people objected to another gas tax hike. Warning: The video tweets embedded in this article contain violent content. Readers please be advised. The protests have concentrated in Paris. 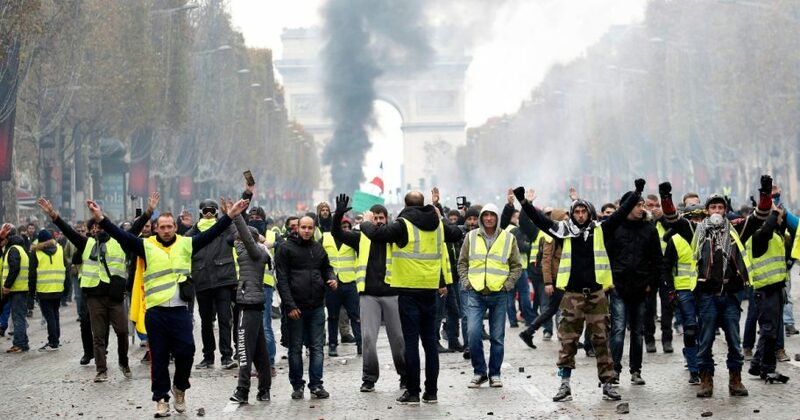 French officials estimate 30,000 people will converge on the city but have little idea how much damage will be caused or how long the riots will last. Officials did not expect the original protests to last much longer than a day, Bloomberg reports. French President Emmanuel Macron’s popularity is sagging as he continues to push an environmental agenda aimed at cutting his country’s carbon emissions. Around 26 percent of French people have confidence in Macron, according to an October poll of 1,000 people by Kantar Public. Around 73 percent of French people support the protests, according to an Elabe poll conducted during the protests. Do you think these protesters have gone too far? French police set aside a downtown park for the latest round of demonstrations, but protesters have spilled out across Paris. Police are dressed in riot gear and are operating fire engines to keep rioters in check. Emergency officials have been seen spraying groups of protesters with high powered water hoses. Various small fires have been set across Paris. Rioters have fought and baited police with rocks and fireworks. Roughly 750 people have been injured, including more than 100 police, and two people have died since the protests started last week.